The Government Amendment Bill for the Goods and Service Tax was introduced in Lok Sabha on 19 December, 2014. Earlier it had been considered by the Parliamentary Standing Committee which submitted its report in August 2013. This is one of the key reform initiatives which commenced during the earlier NDA Government was pursued during UPA I and UPA II. It continues to be a centre piece of our tax reforms. The Finance Minister after an introductory statement on 24 April, 2015 requested that the bill be taken up for discussion and enactment. Congress members and some regional parties objected that the Amendment introduced subsequently after taking account of earlier recommendations of the Standing Committee needed further discussion. They wanted it to be resend to the Standing Committee. This would have delayed this bill for much longer. In essence India still remains a fragmented market. The varied rates of taxes imposed by Centre and States create cascading effect, burden the consumers, deprive government of tax revenue, add to the onerous of compliance and reduce the competitiveness of manufacturing. The Essence of the Amendment Bill lies in subsuming various Central and State indirect taxes including central excise duty, service tax, countervailing duty, state value added tax, octroi, entry tax, luxury tax among others. The Bill aims at creating a single unified national market for goods and services sans of tax distortions. A GST Council will also be constituted. The membership of the council comprises of the Union Finance Minister, the Union Minister of State incharge of Revenue or Finance and the Minister incharge of Finance and Taxation or any other nominations by State Governments. The functions of the council include making recommendations on taxes, surcharges and cesses to be levied, goods and services to be included or exempted and so on. The council will model laws and principles governing GST and decide upon the turnover below which GST can be exempted. It will also decide floor rates and bands of GST. It will suggest special rates to raise additional revenues during natural calamity. The Council would also design special provisions with respect to 10 states including Jammu and Kashmir, Himachal Pradesh and North Eastern States. 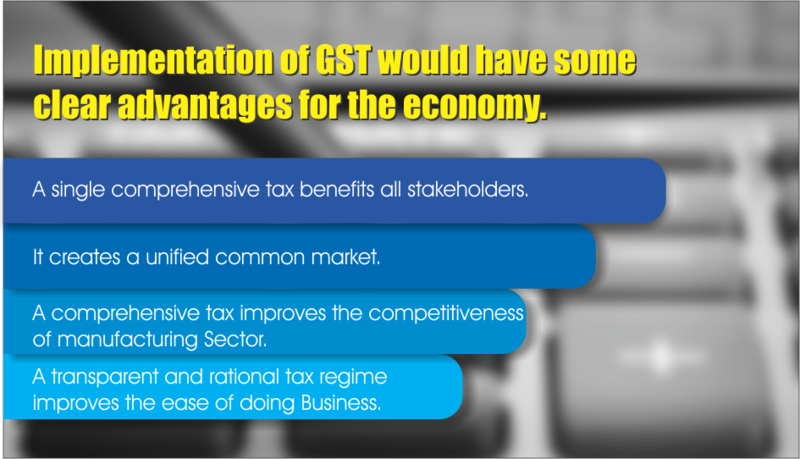 Implementation of GST would have some clear advantages for the economy. First, a single comprehensive tax benefits all stakeholders. Consumers will benefit by paying one tax in place of multiple overlapping taxes like VAT, entertainment tax etc., leading to market distortions. Revenue benefits from the broadened tax base. The suppliers benefit from the minimal burden of tax levied only on the value added by them. Second, it creates a unified common market. The cascading effect of complex indirect taxes is mitigated. The transparency and simplification improves compliance. Third, a comprehensive tax improves the competitiveness of manufacturing sector. In the long run, by promoting growth it improves the per capita income. The purchasing power of the growing middle income population of India is enhanced. Fourth, a transparent and rational tax regime improves the Ease of Doing Business. It boosts investor confidence, encourages capital inflows and gives a fillip to the Make in India programme. Multiple challenges, however, remain unresolved. One, states are concerned that a substantial proportion of their indirect tax revenues are now subsumed in one tax. They are also worried that now the tax revenue will accrue to the destination states and not the manufacturing states. Central government’s decision to reimburse the loss in revenue will allay this fear. In the long run, higher growth would make central support unnecessary. The transitional fiscal burden on the central government will also be allayed. Two, the rate of GST also remains undecided. Tax rates cannot be too low as it will impact Government’s revenue. On the other hand, high tax rates will affect compliance. Our tax rates, in the long run, need to be aligned with the rates in other developing economies. Three, issues such as taxing inter-state transactions at 1 percent has caused concern. It has been decided that such a tax with an upper limit of 1 percent be collected by the Centre and can be assigned to the States for an initial couple of years. The GST Council reserves rights to make recommendations in this context. However, a higher rate of such tax can create production distortions. Four, the exclusion of tobacco, alcohol and petroleum and the real estate sector robs major areas from a unified tax structure. Overtime and given experience, the GST Council can phase these in. 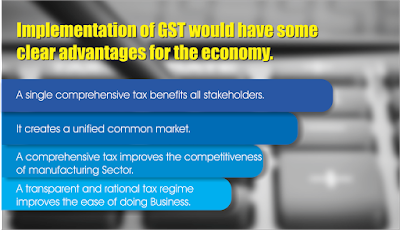 Analysts believe that GST is central to our growth strategy. While estimates vary, many believe that it can add upto 1.5 percent to India’s GDP. It benefits all stakeholders. The glitches have to be resolved overtime. The Best should not become the enemy of the Good. An early GST is now an economic necessity.